Фирма "Gloster" не стала строить самолет для состязаний на кубок Шнейдера 1926 года, но Генри Фолланд и его конструкторы уже работали над преемником Gloster III. Снова была выбрана схема биплана, так как Фолланд полагал, что она обеспечивает минимальную массу ДальшеMore>>> конструкции планера. На новый Gloster IV предполагалось установить еще более мощный вариант двигателя Lion, а аэродинамику довести до максимального совершенства. Поверхность крыла использовали для размещения радиаторов системы охлаждения двигателя, и впервые компания сама разработала поплавки, на верхней поверхности которых также были установлены радиаторы. Охлаждение мощных двигателей стало проблемой для разработчиков всех самолетов, принимавших участие в состязаниях. Чтобы сохранить температуру масла в допустимых пределах, Gloster IV оснастили маслобаком-радиатором под носовой частью фюзеляжа, а дополнительные поверхности охлаждения разместили по бортам, позади кабины пилота. Построили три самолета: Gloster IV с безредукторным двигателем Napier Lion VIIA мощностью 900 л. с. (671 кВт), Gloster IVA с такой же силовой установкой, крылом уменьшенного размаха и оперением иной формы, а также Gloster IVB, аналогичный по конструкции Gloster IVA, но снабженный двигателем Lion VIIB, вращавшим винт через редуктор. Именно Gloster IVB был выбран для участия в состязаниях, став третьим самолетом в британской команде, но машина была вынуждена выйти из гонки на шестом круге. Позднее Gloster IV был продан, но два оставшихся гидроплана продолжали использоваться ВВС для изучения высоких скоростей и для тренировок. In the Gloster-Napier IV we have the latest development of a successful series of racing biplanes - Gloster "Bamel," winner of 1921 Aerial Derby (163 m.p.h.) and holder of British speed record of 196-6 m.p.h. 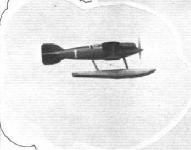 ; Gloster I, winner of 1922 Aerial Derby (180 m.p.h.) and holder of British speed record of 212-2 m.p.h. ; Gloster II, winner of 1923 Aerial Derby (192-4 m.p.h. 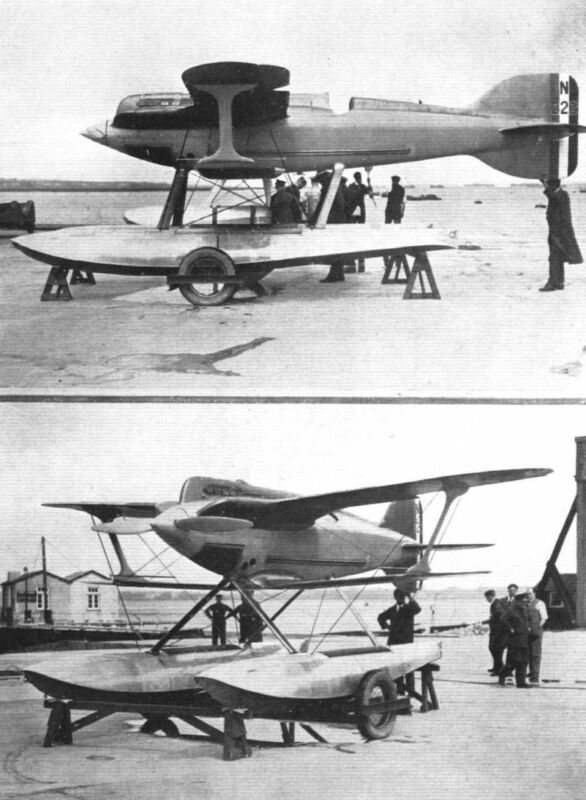 ); Gloster III seaplane, second in 1925 Schneider Trophy contest (200 m.p.h.). In each case the engine was the Napier "Lion." The Gloster-Napier IV shows considerable advance in design on the previous models, although it retains the family resemblance. It is a single-bay biplane, with top and bottom planes attached to the fuselage, the top plane being slightly larger than - or perhaps we should say, not quite so small as - the lower one. It will be noted that the roots of the lower wings curve up into the fuselage, while the roots of the top wings curve down, and merge neatly into the outer engine-cylinder banks. The wings are of the multi-spar type covered entirely with laminated spruce. The interplane struts, which are of the I type, are built up of dural forgings so as to reduce frontal area. Wing radiators, of special Gloster design, are fitted to both top and bottom planes. The cantilever tail surfaces are built integral with the fuselage, and it will be observed that vertical fins are fitted both above and below the fuselage. All the controls are internal, elevator and rudder controls being provided with a variable device giving a ratio of 2 to 3 for small movement, grading off to a ratio of 3 to 2 for the last movements of controls. The fuselage, of extremely fine streamline form, is of laminated spruce monocoque construction, the engine mounting being of weldless steel tubing. It is of "head and shoulders" cross section from front to back, that is a continuous fairing runs from the central bank of cylinders and the pilot's head to the top fin. Petrol is carried in removable tanks in the fuselage, the oil tank and cooler being housed under the engine and forming part of the fairing. Water is carried in a long header tank, which also serves as a gravity petrol tank, forming the fairing between the centre cylinder block and the wind-screen. 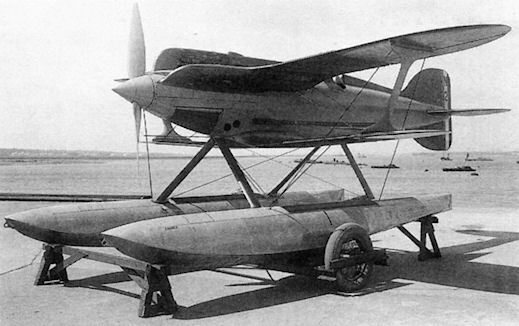 Twin floats of special Gloster design and construction, of duralumin, are employed, and are connected to the fuselage by two widely spaced pairs of V struts. Special care has been taken in their design to obtain a good streamline shape without affecting their qualities on the water. 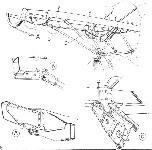 The tractor airscrew is also of Gloster design and construction, and is of the detachable blade type, the blades being machined to their correct pitch and contour from a solid duralumin forging on a special machine - no twisting of the blades being required. 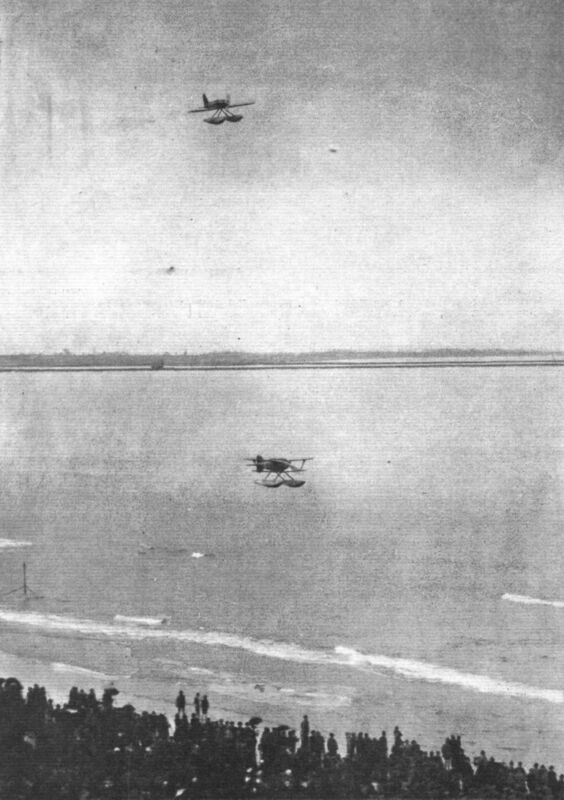 EVER since the earliest days of flying, the question, monoplane or biplane, has been a controversial one, and it is rather interesting to find that the problem remains unsettled right up to the present time, not only as regard service and commercial types of aircraft. In this country by far the largest percentage of aircraft are biplanes, and this applies both to civil machines and service types. In Germany, on the other hand, the preference is for the monoplane, as witness the Junkers, Dornier and Rohrbach machines. In France one finds both types represented, although probably with the biplane, or rather the sesquiplane, in the majority. In the United States there has been, of recent years, a tendency to choose the monoplane for intermediate size commercial machines, although in American service aviation one finds practically no monoplanes. When it comes to racing, again there is no marked preponderance of one type over the other. If we take the Schneider Trophy race for example, there have been monoplanes and biplanes in approximately even numbers, and although the world's speed record stands to the credit of a monoplane, and the Schneider Trophy race was won last year by a monoplane, he would be a bold man who would assert definitely that the monoplane is necessarily the fastest type. In commercial and service aviation it is usually considerations other than those connected with performance which determine the choice of type. In a racing machine the conditions are somewhat different, and low drag is the chief feature aimed at, although there are necessarily many other considerations which have to be taken into account. 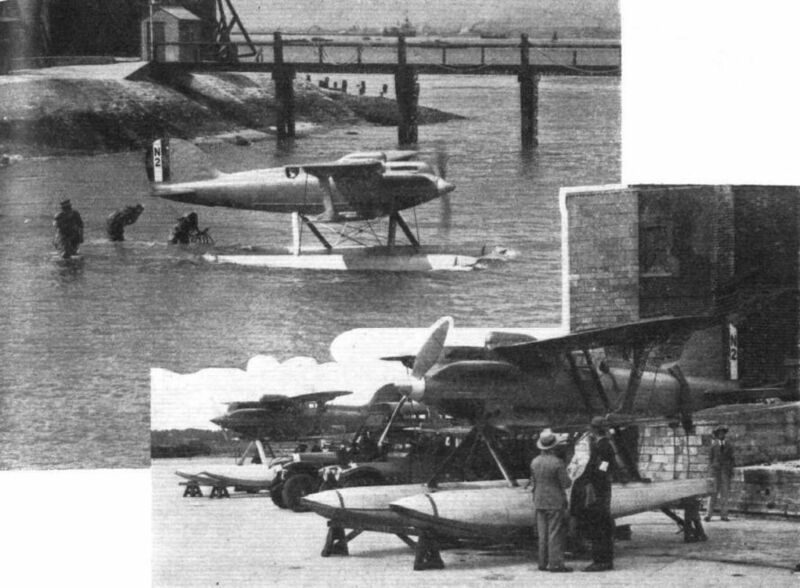 In the case of the "Gloster IV" B, designed and built by the Gloster Aircraft Co., Ltd., for last year's Schneider Trophy race, it is of interest to study the considerations which led to the adoption of the biplane type of machine, and a short article by Mr. H. P. Folland, the firm's chief engineer and designer, which appeared in the "Gloster Magazine" Christmas number, outlines briefly his reasons for making the "Gloster IV" a biplane. Before proceeding to a study of these, it may be as well to point out that up to the present moment there is probably no one who can claim to know quite definitely which is the faster machine, the Supermarine S.5 monoplane, or the Gloster IV biplane. The lap speeds of the race appear to indicate that the Gloster was faster than the direct-drive Supermarine, but slower than the geared S.5. That, however, is not necessarily definite proof, and the probability is that in point of speed there is little to choose between the biplane and the monoplane. And now for the considerations which led Mr. Folland to choose the biplane. "Can a biplane be as fast as a monoplane, given equal horsepower and same design specification regarding performance?" This is the question Mr. Folland asks in the article referred to. He then proceeds to outline the manner in which he and his assistants examined the problem. Comparison was made on three chief points: Speed, wing rigidity, and application to service requirements. Of these the first was the most important, and Mr. Folland states that what decided him was the fact that, with the "broad arrow" type of engine it was possible to fair the top wing into the cylinder blocks, to get all wires leaving the surfaces at large angles and thus reduce interference, to use a small-chord, thin-section bottom wing, the roots of which could, by curving them, be fitted into the fuselage with a minimum of interference, and finally by having surface radiators on both wings, to get a larger percentage of the radiators into the slipstream from the airscrew. From the structural point of view doubtless Mr. Folland was also influenced in his choice by the fact that torsional rigidity, or in other words guarding against wing flutter, is, perhaps, rather more easily achieved with a biplane structure than with a monoplane. Finally, although we doubt that it weighed very heavily in coming to a decision, the Gloster company has had years of experience in building fast biplanes. In the number, of the "Gloster Mag." already mentioned, there is also an article by Mr. H. E. Preston, assistant chief engineer and designer, in which certain interesting information relating to the development of the "Gloster IV" of 1927 from the "Gloster III" of 1925 is dealt with. In this article Mr. Preston points out that, on the two items offering the greatest head resistance, the fuselage and the floats, by reducing the area and revising the lines, in other words the form, a saving of 45 per cent, of the 1925 machine was effected. Careful and smooth blending of the wings into the fuselage not only resulted in a reduction of the drag, but also gave an increase in lift of 15 per cent. The total reduction in resistance of the whole machine as compared with the "Gloster III" amounted to about 40 per cent, on the latter. By way of comparing the relative efficiencies of the two Gloster racing machines, Mr. Preston takes as his criterion the ratio of maximum lift to minimum drag, and how great was the improvement on this basis will be realised when it is stated that the ratio for the "Gloster III" was 26-2, while in the "Gloster IV" this ratio has been increased to 42-3. This table brings out fairly clearly the relative importance of the various main items. Having now outlined briefly the main considerations in aerodynamic design, we may turn to the constructional features of the "Gloster IV." The fuselage section used practically precluded the more usual forms of construction, and ultimately a form was chosen which was regarded as giving the best solution of the somewhat conflicting requirements of good aerodynamic shape and reasonable ease of construction. This took the form of what is known in boat-building practice as the "double-diagonal" system, in which fairly narrow planks are laid on at an angle of about 45 deg. to the centre line and the planks of the two skins crossing each other at approximately right angles. In the "Gloster IV" these planks are of spruce, about 3 in. wide and 1/16-in. thick. Generally speaking there are two skins, but in places where the loads are more intense, the number of laminations is increased. The fins are built integral with the fuselage, and like it are covered with laminated spruce. The wooden tail plane is adjustable on the ground, and can be set to any desired incidence, although it is to all intents and purposes integral with the fuselage. In designing the engine mounting of the "Gloster IV" rigidity was aimed at as a first consideration, but the question of accessibility was not overlooked, and in the end a type of mounting was evolved which proved very satisfactory from both points of view. This is shown by some of our sketches. Two box section Duralumin engine bearers are supported on a system of steel tubes. Welding is entirely avoided, and all main joints are fitted with stainless steel taper bolts of ample dimensions to secure a good fit. Under the engine bearers is mounted the oil tank, which incorporates the oil cooler, the tank being made to the contour of the fuselage, and the cooler taking the form of corrugations through which the oil passes after leaving the engine. Auxiliary coolers are mounted on the sides of the fuselage. The petrol system is somewhat complicated by the fact that the tanks are all contained inside the fuselage. Thus, it might be said that in all there are seven petrol tanks, although it would, perhaps, be more correct to say that there is one main tank divided into three, one auxiliary tank also divided into three, and a service tank placed in the top deck fairing of the central cylinder bank. The general scheme of the tank installation is shown in a diagram. Webs are provided for lifting the tanks out of the machine, and the division into three has been made necessary in order to get the tanks in and out through relatively small openings in the body. 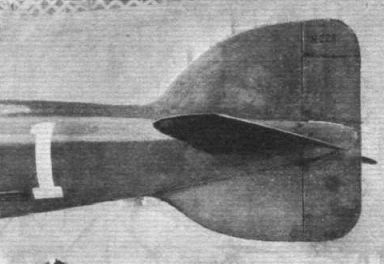 The wing construction of the "Gloster IV" is unusual in that the skin or covering is made part of the stress-bearing structure. 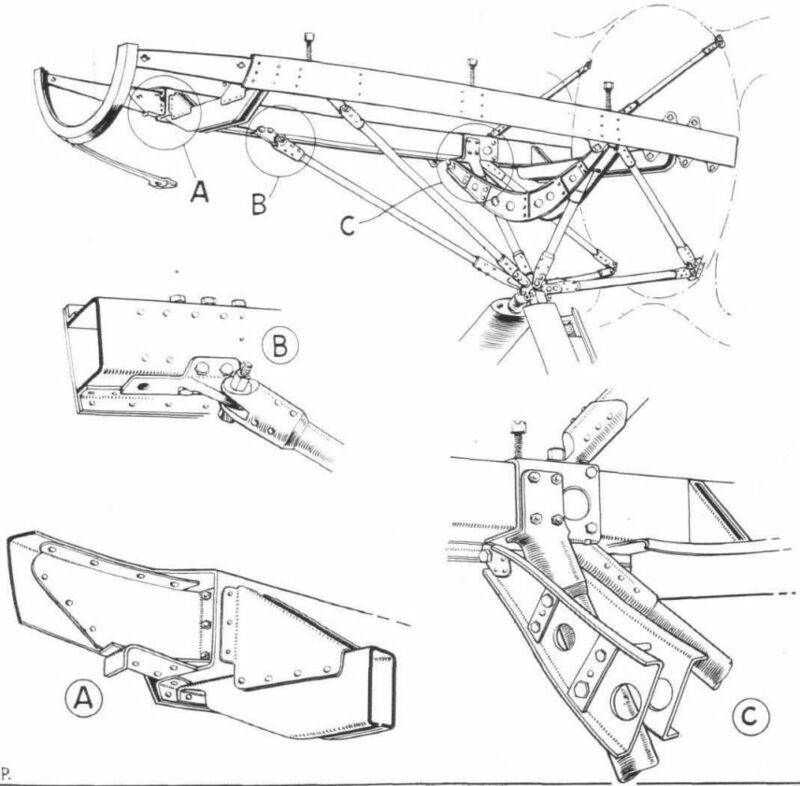 Built up of laminations similar to those employed in the fuselage, the thin and almost symmetrical aerofoil sections used were formed by building up the skin on formers of the required contour and secured to the skeleton, which consisted of multi-spars, leading and trailing edges, and intermediate contour pieces in place of the usual ribs. On load tests the wings were found to support a load equivalent to 13 times the weight of the machine before signs of failure were observed. Thus, there was a good margin of safety in hand to take care of the increased acceleration possible in such a high-speed machine. Reference has already been made to the wing bracing from the aerodynamic point of view. The excellent angle of the lift wires has the further structural advantage that they impose but a very small compression load in the top wing spars. The angle of the landing wires, or as they are more usually called nowadays, "anti-lift" wires, is not quite so good, but is still better than usually found. To prevent the landing wires from going slack and vibrating when relieved of some of their load, a neat shock-absorbing or compensating arrangement has been employed. The internally-placed ends of the "anti-lift" wires have large nuts which, when the wire is taut, bear on the edges of a cup, inside which are a number of rubber discs. When some of the load on the wire is reduced, these rubber discs expand and in so doing keep the wire reasonably taut. The arrangement is illustrated by a sketch. Mounted on the wings are the surface type radiators specially developed by the Gloster Company. These radiators are made of thin corrugated copper sheet with waterways of brass at leading and trailing edges. Additional surface radiators are mounted on the decks of the floats, and as these are practically water-cooled during prolonged taxying on the surface, they are very effective at a time when the engine is most likely to overheat. The floats are of Duralumin, of the single-step, curved deck type, and from the side elevation and the side view photograph it will be seen that they are slender and tapered to reduce air drag. They are supported on two pairs of struts, both pairs meeting on the centre line of the fuselage, and depending on the wire bracing for their stability. Horizontal wires connect the two floats, in place of the struts usually employed some years ago. The controls are all internal. The ailerons are actuated by torque tubes running inside the top plane, while the elevator and rudder controls are inside the fuselage. These controls are fitted with a special variable-gearing device, giving a ratio of approximately 3 to 2 for the initial movement of the control column, and a ratio of 2 to 3 for the final movement. This gives the pilot a control which is not only light and effective at high speeds, but also at low speeds and when alighting or taxying. The propeller was made by the Gloster Aircraft Co., and is a Duralumin forging milled on a special machine to the correct contour and pitch. Thus, no twisting of the metal is required, and it is claimed that adequate stiffness and a minimum of blade distortion under load are attained. Finally, the weight empty of the "Gloster IV" is 2,300 lbs, while the useful load is 710 lb., including 11 gallons of water, 5 1/2 gallons of oil, 55 gallons of petrol, and 15 lb. of instruments. As the wing area is 130 sq. 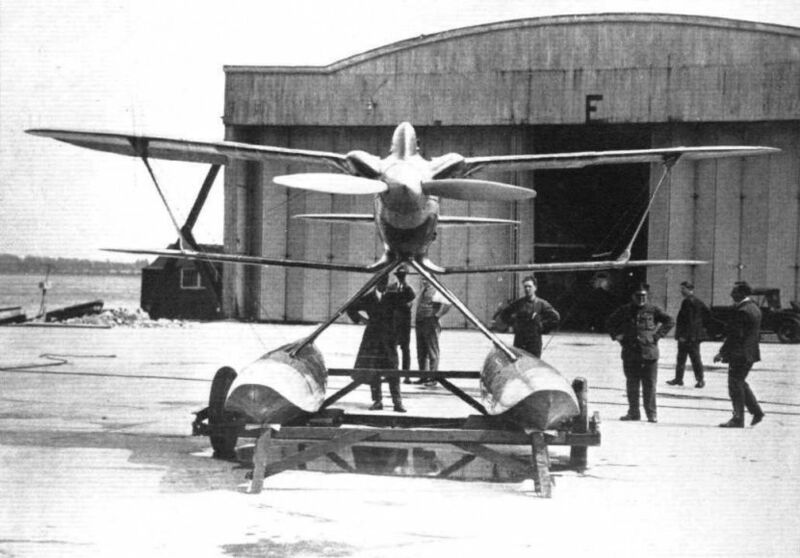 ft., the wing loading is 232 lbs./sq. ft. The power loading = 3-44 lb./h.p. Gloster IVА N222 (на снимке) был доставлен в Венецию 16 августа 1927 года вместе с Gloster IVB N223. Последний позднее принял участие в гонках на кубок Шнейдера того года, но победу в соревнованиях одержал Supermarine S.5. THE BIPLANE CHALLENGER: Two views of the Gloster-Napier IV. Note the exceptionally neat fairing of the "Lion" engine which merges into the fuselage and wings. TWO OF THE TRAINING MACHINES: Two Gloster IV's with Napier "Lion" engines are being used for practice purposes by this year's Schneider team. THE BRITISH CHALLENGER FOR THE SCHNEIDER TROPHY CONTEST: This front view of the Gloster-Napier IV biplane give an excellent idea of its clean lines. THE "GLOSTER IV B": Front view. Note the excellent angles made by the bracing wires. THE SCHNEIDER TROPHY RACE: Three views of Lieut. Kinkead's Gloster-Napier, taking off, towing and taxying. 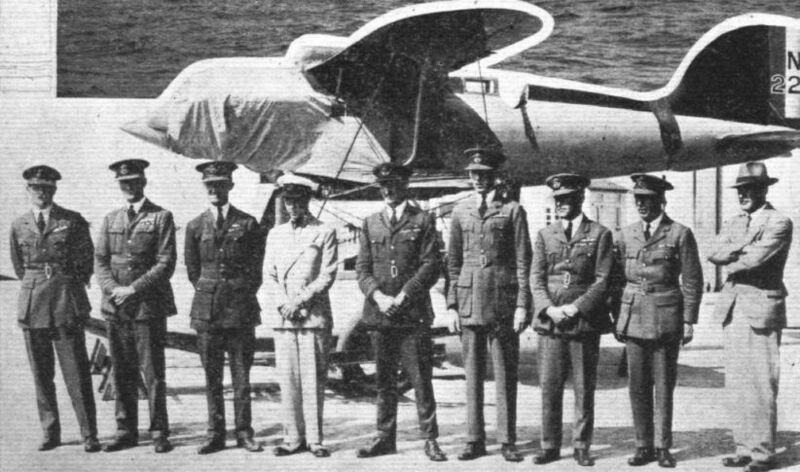 THE 1927 SCHNEIDER CONTEST :- Flight-Lieut. Kinkead opens the Ball on the Gloster-Napier IVb. THE "GLOSTER IV B": Reducing interference was one of the great problems in the design. These photographs indicate how interference between wing roots and fuselage was reduced by avoiding sharp angles. The top plane fairs into the outer cylinder blocks, and the lower wing roots curve down and outwards, being initially at right angles to the surface of the body. 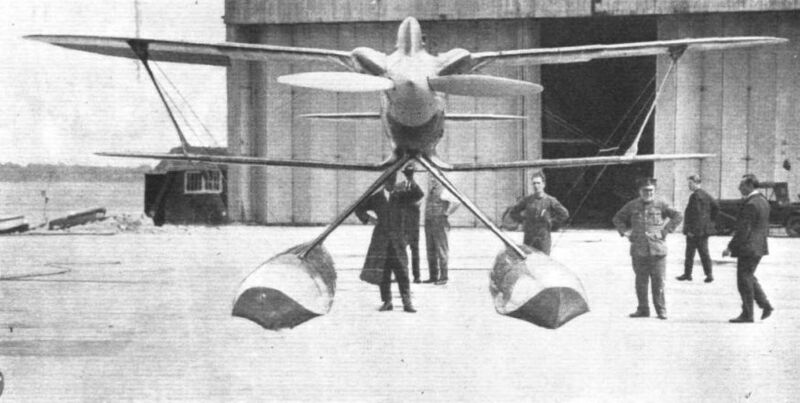 THE "GLOSTER IV B": View of the nearly symmetrical tail surfaces. 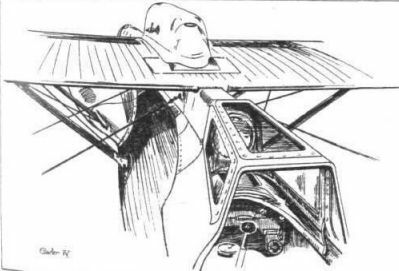 This sketch illustrates the special type of windscreen which is used to protect the pilot from the force of the terrific air stream in the Gloster IV. THE "GLOSTER IV B": 1, shows how anti-lift wires are prevented by rubber buffers from going slack when relieved of load. 2, the "double-diagonal" method of planking the fuselage. 3, showing how rivets are finished off flush with skin of float to reduce air friction. THE "GLOSTER IV B": On the left, the arrangement of the seven petrol tanks in the fuselage. There are three main tanks, three auxiliary tanks, and one service tank. On the right, a diagrammatic perspective representation of the water system, one-half only being shown. Note the radiator on the port float. 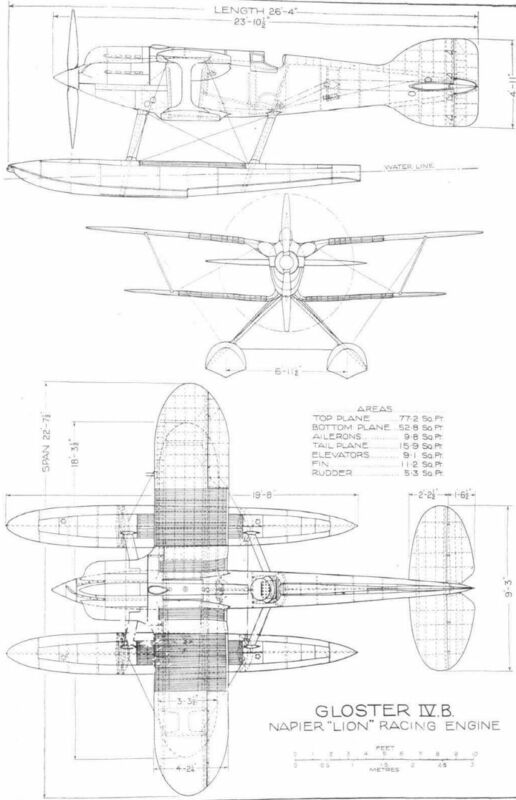 THE "GLOSTER IV B": Some constructional details. Above, a general view of the engine mounting; and below, some of its details. THE "GLOSTER IV B": The wing surface radiators. On the left, the outer end of the lower plane radiator, showing also the Duralumin interplane strut. On the right, the water piping entering the fuselage at trailing edge of lower plane.